This year, my husband and I decided to take a little break from the pressure and excitement of the last week before the big day with a little mini-vacation. 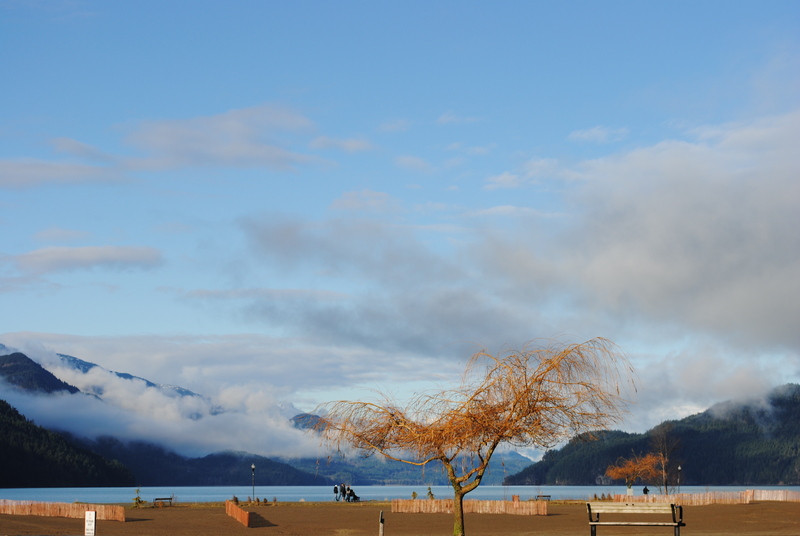 We booked a two-night stay at Harrison Hot Springs, a beautiful scenic spot an hour and a half from home. Harrison Hot Spring’ sandy beaches are surrounded by majestic mountains, a lovely spot at any time of year. It was just the place for a quiet pre-holiday getaway, a hidden gem far from the madding crowds. There is not a Starbucks for miles! We spent our time exploring, chatting, reading and generally relaxing and soaking up the quiet beauty of the village. My husband took a ton of photos, I read an entire book. We enjoyed each other’s company. It was rejuvenating. Now, we are back home, and it is almost like we had never gone. I look over at him, sitting on the sofa, reading and I smile a little, remembering our “retreat”. I can draw on our time there when the holidays get too hectic – a little calm in the midst of frenzy. I was standing in line at the lottery booth – I was waiting my turn to purchase a Lotto Max ticket, a chance for a $30,000,000 windfall (a pipe dream, I know). A young woman stood at the counter ahead of me, taking her time, choosing her tickets with care. A small boy was with her and he eyed me mournfully, a testament to his boredom at being in the mall much too long, looking up at me as he spun a slow circle around his mom. I smiled at her as she glanced at me, she had beautiful, long, black hair and bright black eyes. She looked at her son, then commented to me that it was her birthday and she thought she would treat herself to a chance at making it big. Then she leaned in and said that really she was grateful for everything that God had provided for her and lovingly caressed her son’s shining hair. She seemed a little odd, opening up to a stranger, letting me into her life a little, exposing a vulnerability. “Happy Birthday”, I said “and good luck in the lottery” as she smiled and walked away. I purchased my ticket and left the kiosk, and thought about that little exchange of conversation. It made me think about how I usually perceived the people around me in my daily life. How I really don’t see my fellow humans even when they were right beside me. I looked around and saw a myriad of persons walking, talking, eating, shopping, generally going about their everyday lives much as I was. What are their stories, their hopes, their dreams, their fears and anxieties? I realized how disconnected we all are from each other, and how easy it is for us to ignore everyone around us. Whether from indifference, fear, insecurity, it really doesn’t matter. What matters is that we, as a society, as a group, neglect to notice, to reach out and touch the very individuals that are right before us. I made a promise to myself then and there. I would try to reach out more to the people around me, those I love, those I know and those I don’t know at all. I wish I had bought that young woman a lottery ticket for her birthday.